Most people don't know that it was not in 1903, but in the 1800s, that the Wright brothers, working with kites, had worked out the key issue for flight: control. While other aviators searched in vain for "inherent stability," Orville and Wilbur created a method for the pilot to control the airplane. The real breakthrough was their ingenious invention of "wing-warping." If the pilot wanted to bank a turn to the left, the wings could be warped to provide more lift on the wings on the right side of the biplane. 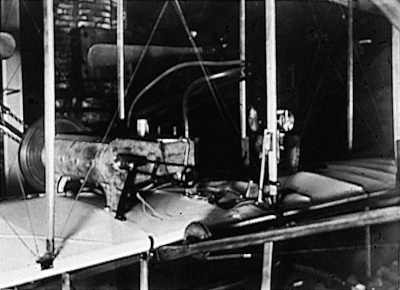 The brothers worked out a system for 3-axis control that is still used today on fixed-wing aircraft: left and right like a car or boat (a rudder), up and down (the 1903 Wright "Flyer" had its elevator in the front), and banking a turn as birds do (or like leaning to one side while riding a bicycle). 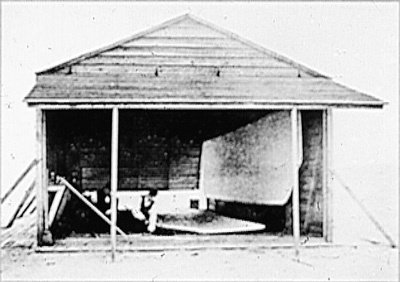 Working with kites in 1899, the brothers figured out and tested their systems for 3-axis control, and in the next two years did experiments with gliders at Kitty Hawk, and then with their wind tunnel, to find the proper lift. They found that the formula for lift - namely the "Smeaton coefficient" that everybody had been using for over 100 years - was wrong. By the time they built their 1902 glider, they had worked out all the problems and they knew it would fly. The 1902 glider was actually the first fully controlled heavier-than-air craft, and some historians believe it was the main invention - essentially the invention of the airplane - and more important than the 1903 biplane. So it was on March 23, 1903 - nine months before the famous first airplane flight of December 1903 - that Orville and Wilbur Wright filed a patent application for a "Flying Machine." The patent was awarded May 22, 1906. That's when the aviation world started to copy the Wright's designs, and from that point remarkable progress was made in the development of powered flight. The next step from the 1902 glider was powered flight. Like everything else the Wright brothers did up to this point, they applied a scientific method: break bigger problems down into smaller ones, study as much as possible what people have discovered before, understand the principles and the theory behind the particular problem you're trying to solve, and do some experiments to work out the particulars. For powered flight the main problem was understanding how propellers work. This was harder than it seems, as no one really understood that a propeller was nothing more than a wing that rotates on its axis, and lifts the plane forward. So, the Wrights turned to the ship-building literature and discovered that empirical principles were used, but there was no theory of propulsion. They then reasoned out the basic mental model of the propeller as a moveable wing. This allowed them to test propeller shapes in their wind tunnel, discovering an efficient shape. For their 1903 plane, they needed all the efficiency they could get. To drive a propeller, you need power. 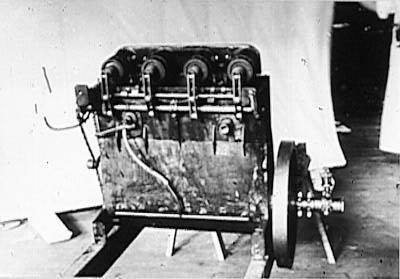 The Wrights wanted a lightweight gasoline engine that would provide the necessary oomph. They tried to buy an engine, but no one was willing to build one to their specs. So, with the able assistance of Charles Taylor, they built their own. It was a state-of-the-art four-cylinder model. Taylor hand-tooled the crankshaft on the Wright shop lathe. Its power-to-weight ratio was better than anything around. Even still, in the words of Charles Taylor, "It weren't much of an engine." There was no carburator. The raw gas was just dumped into the cylinders. It was air-cooled, without even the benefit of fins. To control the engine speed, the spark could be advanced or retarded. It had the horsepower - barely - to drag the 1903 machine into the dense December ocean air. As the engine broke in the next year, it began to produce more horsepower, and better flights. Kitty Hawk, NC (North Carolina), December 17, 1903. 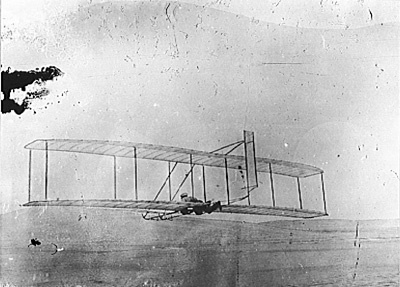 Orville Wright's famous first airplane flight. See a bigger picture, or a huge high-resolution (300 dpi letter/A4) photo (8 MB gif). On Monday, December 14, 1903, when both the Wright flyer and the wind were ready, the brothers decided that Wilbur would take the first turn as pilot for the historic flight. Some readers might suppose that this was because Wilbur was older, or because he had taken the early lead in the project (though later there was an equalization), or perhaps because of some difference in piloting skills. It was none of these. It was decided by flipping a coin. They and the ground crew (5 lifeguards from the beach) had lugged the plane weighing six hundred pounds 1/4 mile to the big hill, laid out the 60-foot monorail, and were ready to go. After an initial problem getting it unhooked because of the slope (and the force from the propellers), the plane accelerated down the track so fast that Orville, running alongside to steady the wing by holding on to an upright, couldn't keep up. 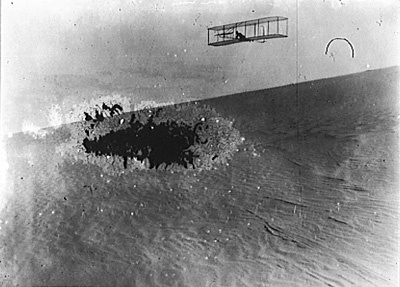 Wilbur turned the sensitive rudder up too sharply, the flying machine nosed up, slowed, came down in that position, and the left wing hit the sandy hillside and swung the plane around, breaking several parts. Although they didn't consider this a real flight, they now knew it would work. Two days later, repairs had been completed, but the wind wasn't right. The following day, Thursday, December 17, 1903, would be the historic day. They realized it would be better to lay the track on flat ground. That and the strong (22-27 m.p.h.) 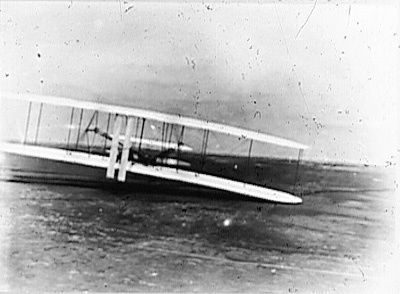 winds meant that Orville (whose turn it was to pilot) was riding the plane along the track, at a speed that allowed Wilbur to keep up easily, steadying the right wing as Orville had done 3 days earlier. 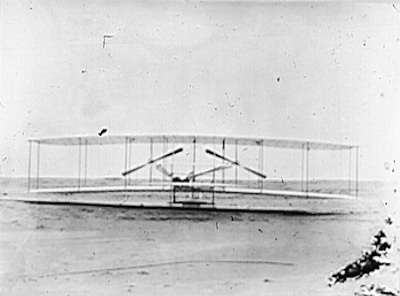 Just after the Wright flyer lifted off the monorail, the famous picture was taken, possibly the most reproduced photograph ever, which Orville had set up (having asked one of the men simply to squeeze the shutter bulb after takeoff). The flight wasn't much - 12 seconds, 120 feet. 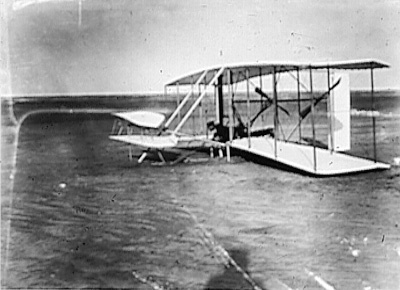 But it was the first controlled, sustained flight in a heavier-than-air craft, one of the great moments of the century. The brothers flew 3 more times that day, covering more distance as they got used to the way the large front "rudder" (the elevator) responded in flight. 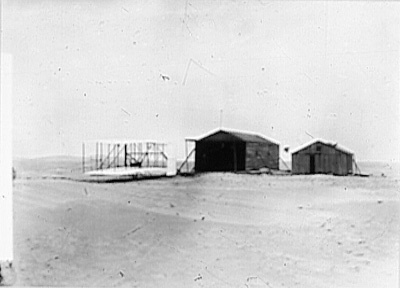 Orville's second flight was 200 feet, and Wilbur's before it nearly as long. But the final flight of the day carried Wilbur 852 feet in 59 seconds. Go to the Inventor's Gallery (on the main site). by Tom D. Crouch. Highly recommended. 1. This is officially recognized by the Federation Aeronautique Internationale (FAI): "the first controlled, powered, sustained (from takeoff to landing) flight involving a heavier-than-air vehicle, using mechanically unassisted takeoff (thrust/lift created chiefly by onboard propulsion)." All photos on these aviation history pages may be freely used for any purpose. Please mention "www.wright-house.com/wright-brothers" in the photo credit. This page created 7/26/96; updated 12/20/11.